Dodge says the corporate culture of the Glen Allen-based company is based on integrity and the Golden Rule. “That is the way we treat our clients and our employees,” Dodge says. “We have a strong amount of forgiveness and grace on our team. A professional recruitment and staffing firm, Accounting Principals provides executive search, professional consulting and temporary staffing through its divisions, Ajilon and Parker+Lynch. Nationally, the Jacksonville, Fla.-based company has more than 75 locations and 1,000 employees. The Glen Allen office employs about 20 people. Founded in 1991 as Accounting Solutions, the company was sold to Accounting Principals in 2005. Five years later, Accounting Principals became part of The Adecco Group, an international staffing company based in Zurich. The company’s benefits provide partial reimbursements for gym memberships, yoga classes and personal trainers as well as smoking cessation and weight-loss classes. Each year, two or three company employees from around the world are picked to participate in events as part of the company’s Win4Youth initiative. The program encourages employees to participate in fitness and sports activities to raise money for children’s charities. Employees this year attended a triathlon in Lanzarote, one of the Canary Islands. The firm also encourages employees to volunteer. 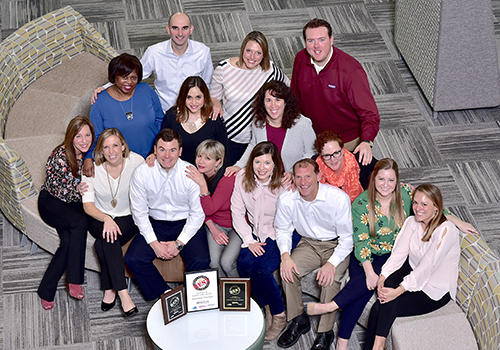 Staff members form teams three to five times a year to help causes such as Junior Achievement of Central Virginia’s financial literacy program and the Caring Clothes Closet, which provides free clothes to families in crisis. Each employee also gets one day off to volunteer for a cause. Accounting Principals also is known for the cookies employees give out during the year.